Too often, family holidays involve compromise. To keep the children happy, you choose somewhere to stay that ‘ticks the boxes’. You opt for the resort with the massive swimming pool; the playground; the on-site pizza restaurant; the kitchenette; the sandy beach – because you know that’s the proven formula for success. But somewhere along the way you end up in a place you’re not actually that interested in. You could be anywhere – and you accept that doesn’t really matter because you’re not going to see much beyond the compound’s walls anyway. 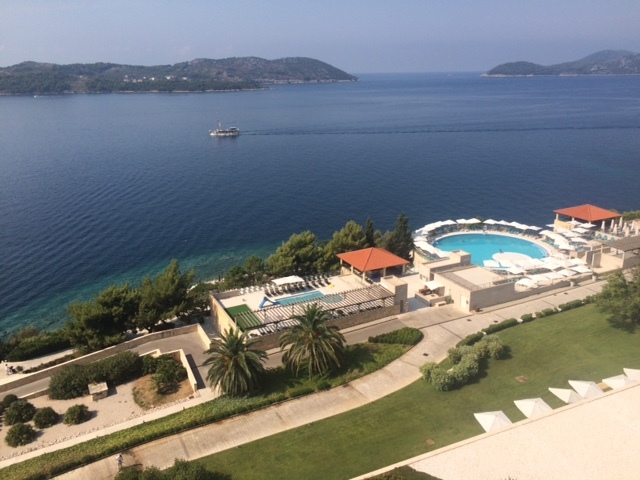 My recent stay at Sun Gardens resort – just outside Dubrovnik in Croatia – proves, however, that it does not have to be like this. A holiday here is all about the destination – a destination that is no secret and undeniably in its ascendancy, yet still provokes coos of intrigue at the school gates. Here you can combine sightseeing in one the most impressively preserved walled cities in the world with dips in crystal clear waters, boat trips to Pine-covered islands and long waterfront lunches eating some of the finest seafood in the Med. In a word, it’s gorgeous. And staying at Sun Gardens means you can enjoy all this without condemning your kids to the boring-est holiday of their lives. In fact, they will probably end up having more fun that you. Sun Gardens is not located in Dubrovnik itself, which is actually a good thing. You are away from the cruise ship hoards, which can be overwhelming in high summer. Rather, you are in the picturesque village of Orasac, about a 25-30 minute drive (or boat trip) up the coast. The resort itself has something of a split personality. There’s a smart and architecturally-striking hotel, part of the Radisson Blu group, which offers more conventional rooms; then there are the ‘residences’ – apartments that come with 1, 2 or 3 bedrooms, kitchens, living areas and terraces. These are perfect for families as you get all the space you need (no-one has to suffer a sofa-bed)and the ability to fix a bowl of pasta or a salad; but you also get all the services of a hotel, including coveted twice-daily maid service (I do love turndown). 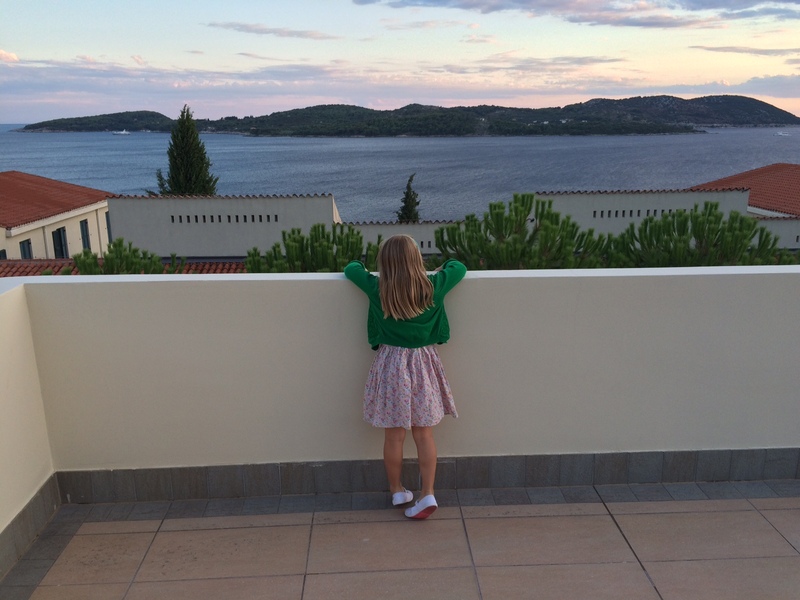 Then there’s the childcare – the key to allowing you to get out and enjoy the pleasures of the Dalmatian coast that lie beyond. There are a couple of options. The resort runs a well-regarded Kids Club, that operates for 2 hours in the morning and then again in the afternoon, plus a daily evening session from 8-10pm; however, you can only leave children 3 years and older. We used the Scott Dunn Explorers Club (only available to guests who book with Scott Dunn), which takes children from 4 months – meaning we could leave our 14-month old son with his older brother and sister (activities are split into age-appropriate groups). As Explorers runs from 10am to 6pm, with lunch provided by the Club, you can also go out for the whole day, giving you more options for exploring. Safe in the knowledge that our kids were happy and being expertly cared for, explore we did. Just 10 minutes in a taxi down the road is the village of Zaton, which is set on an inlet in the coast surrounded by dramatic mountains. Here you have the choice of several excellent restaurants to linger in over long, Prosecco-fuelled lunches, followed by a dip in the alluringly calm and clear waters. 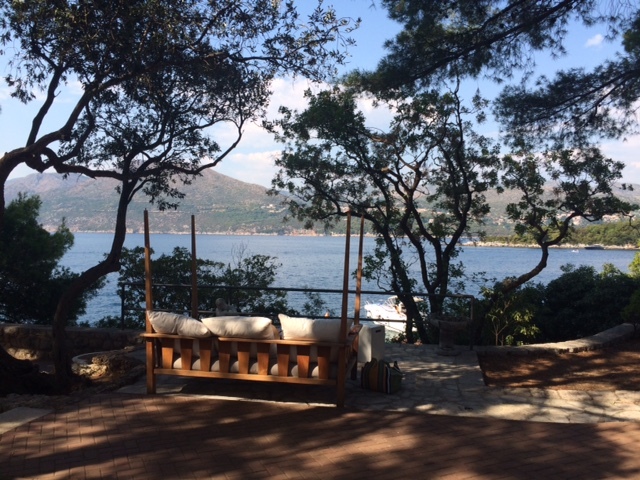 Then there’s the islands that beckon on the horizon as you stare out from the resort, Lopud and Kolocep. Sun Gardens actually put on a daily boat to Lopud, so it’s cheap and easy to get to. And it’s delightful – utterly picturesque (if you screen out one rather over-bearing hotel), rare sandy beaches and a stand-out restaurant, Orsan, serving the ‘best Octopus in the world’ according to my wife (who would admit she is not an octopus expert). My wife and I had such a lovely time here we decided to bring the kids back with us on their day off from Club. It made for the perfect family day out: a boat trip, sand castles, swimming and a golf buggy ride (there are no cars on the island) offered all the adventure we needed. 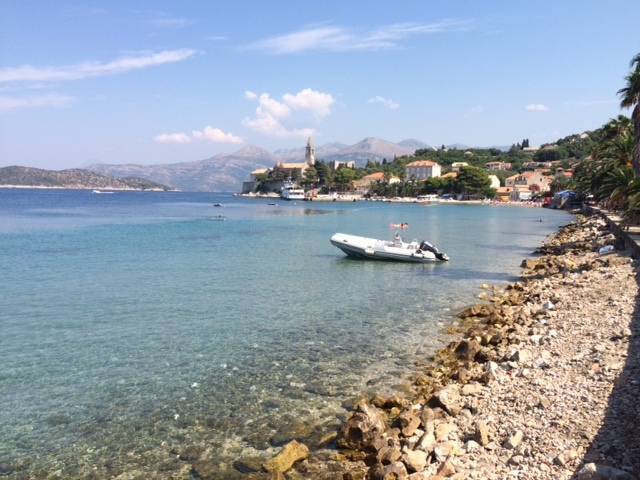 Whilst Lopud attracts its fair share of day trippers, Kolocep is much quieter. You need a private charter to get here from the resort but the excellent hotel concierge, Kristina, said it would be worth it for lunch at the renowned Villa Ruza restaurant. She wasn’t wrong. 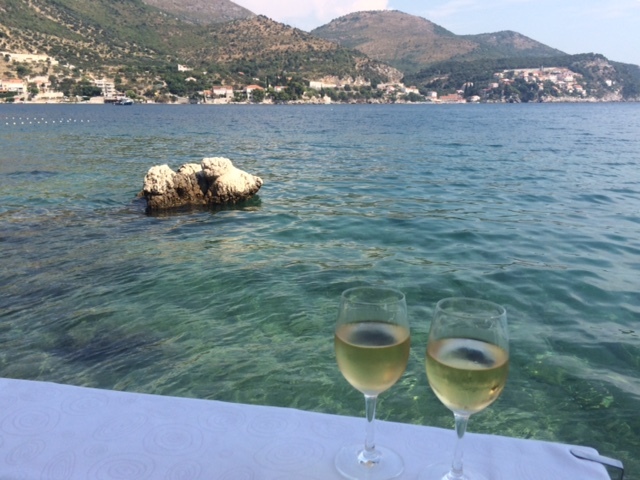 The 5 minute speedboat journey was a thrill in itself and the restaurant has a romantic, lazy setting with shady day-beds for post-lunch snoozing. We loved it. Then there’s Dubrovnik itself. Utterly stunning, its visual coherence is almost Disney-esque; you can see why it’s so popular with the cruise-ship brigade. But in all honesty, it’s best enjoyed in the evenings, once the ships have left. The dining scene is sophisticated and we could have happily spent a whole week working our way round the recommended restaurants. 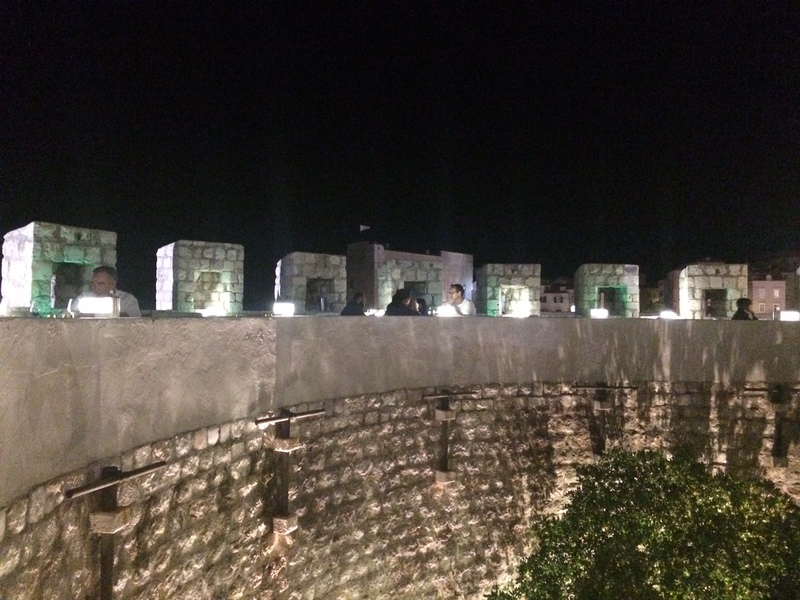 In the time we had, we settled for the curiously-named but supremely atmospheric ‘Taj Mahal’ – not Indian, but Bosnian (think mouth-watering meat and hearty soups); and ‘360’, a fine dining option with the most incredible location on the city walls. Achingly-hip, with excellent service, this is the choice for date night. The food was very good (not outstanding) but you could forgive pretty much anything just to be there. Cost-wise, you can dispel those ‘Eastern Europe’/non-Eurozone ideas that Croatia is cheap; it isn’t. You’d probably spend less on essentials and eating out in Spain or Portugal. But neither is it expensive and best of all, despite being 5 star, the Sun Gardens resort never seemed to over-charge or feel like a ‘rip off’. The onsite travel agency, Korkyra, is excellent, organising everything and barely charging a premium (a pre-booked luxury taxi into Dubrovnik with them was £21, versus £20 for a taxi on the meter from Dubrovnik). They make it easy for you to do anything and go anywhere without the hassle of hiring a car (although we did end up hiring a convertible Beetle from them for a seriously cool day cruising along the jaw-dropping coast road). There’s a supermarket in the resort which we used extensively – reasonably priced with no obvious resort-premium, it saved you trekking out to find things cheaper. We didn’t eat in all the restaurants in the resort, but there’s a good choice and the food we had was good (our favourite restaurant was Cilantro overlooking the sea). So there you have it. Happy parents, happy kids, no compromises. And a new-found love for an incredible country that has had left us wanting more. Since my return to the UK I’ve already been scouring Google Maps, virtually exploring the coastline and planning future holidays to intriguing corners and far-flung islands. 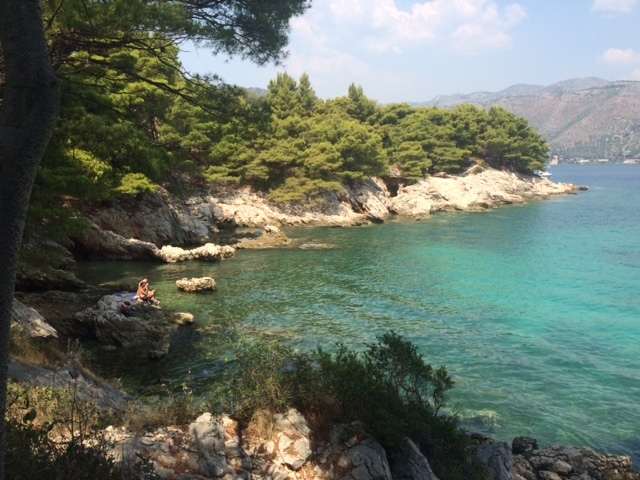 But wherever we might go next in Croatia, I’ll make sure to squeeze in some more time at Sun Gardens. Because, for that all-important R&R time and family harmony, it’s difficult to beat. Go on a day trip to Lopud. Costing about £13 per person return, it’s a lovely 30 minute boat ride away, long enough to enjoy the spectacular views but short enough for little ones not to get twitchy. There are two sandy beaches on the island – a rarity for Croatia and great for little-ones. We preferred the one right by the harbour: it’s small but you can rent loungers, don’t have to trek far and the sea is super-calm. 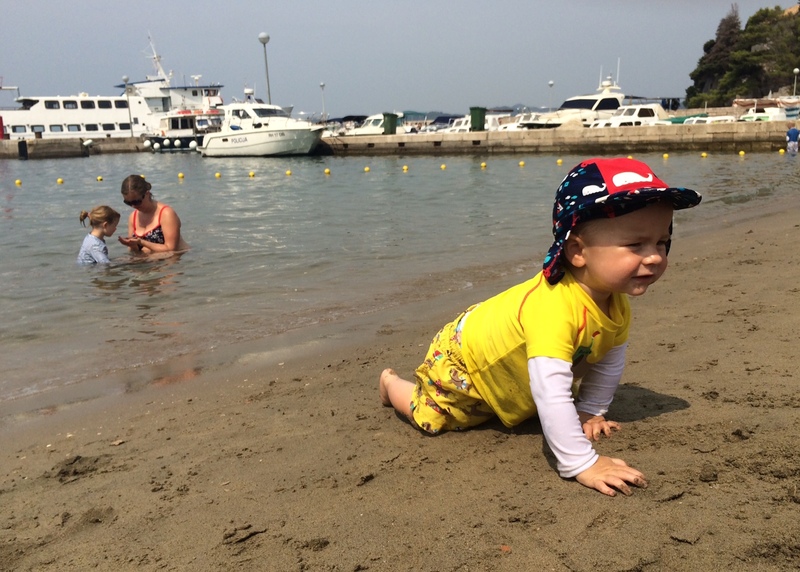 We could happily have our baby crawling around the shore without fear of him being knocked over by a wave. That said, I did take my elder two children on a golf-buggy ride to the other, larger sandy beach, Sunj, on the other side of the island, just for the fun of it! If you’re there in high season, make sure you book lunch at Obala – on the waterfront, it really is exceptional and will do half portions for kids (with posh fish and chips and pasta on the menu). If you fancy a buggy-able stroll to get a tired child to sleep, head along the prom to the patisserie at the far end of the bay – the cakes are exceptional! Take a speedboat to Kolocep. It’s just five minutes across the water to this diminutive island but it’s a fun and filmstar-ish to travel in a private speedboat from the resort (£60 return). Your destination must be Villa Ruza, a perfectly situated restaurant with idyllic views out to the mountains on the mainland and Lopud. After lunch doze on the daybed amongst the Pines or stroll along the prom to the little sandy beach. If you really want to lose your inhibitions, strip off at the rocky naturist beach next door and plunge in. 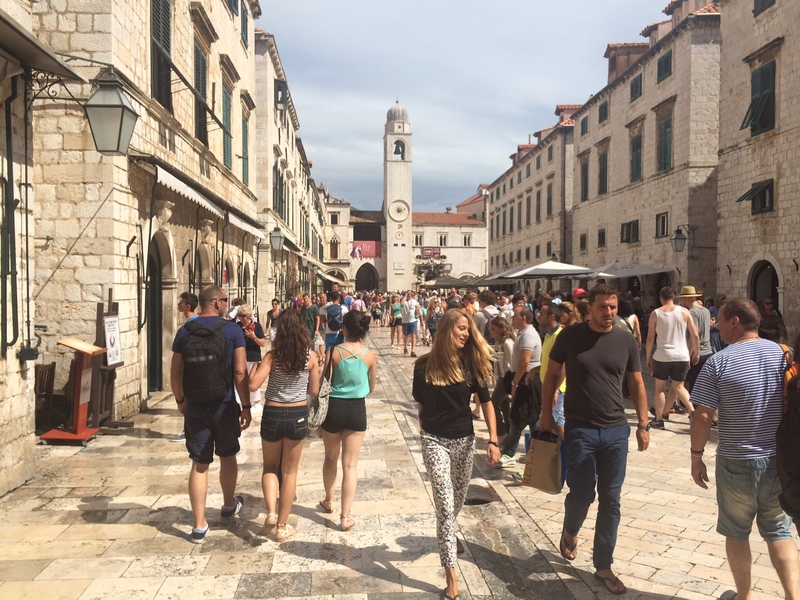 Go for dinner in Dubrovnik. You really want to enjoy the city in the evening when the cruise ships passengers have all left for their boats and the place regains an air of calm. The hotel (and Scott Dunn) offer babysitting services and with minibus transfers into the city costing just £4 per person, there’s no reason not to go and sample the wonderful array of restaurants. Nautika and 360 are the ‘destination’ dining experiences but you’re spoilt for choice. Enjoy long lunches in nearby Zaton. You can leave your sunlounger at the pool and be at your waterfront table within 10 minutes using the hotel’s excellent taxi service. The hot picks are Ankora (try the fish sharing platter); Konoba Kasar (idyllic setting a bit further away from the hubbub); and Orsan (for outstanding squid ink risotto). Cruise up the coast to Ston in a convertible. Ston is an incredible walled city about 45 minutes drive from Sun Gardens. Reputed to have the longest wall after the Great Wall of China, it’s an impressive site – you can walk over them and there’s a long and a short route (little legs will find the short route more than enough). The adjacent village of Mali Ston is reknowned for oysters and has first-call seafood restaurants. 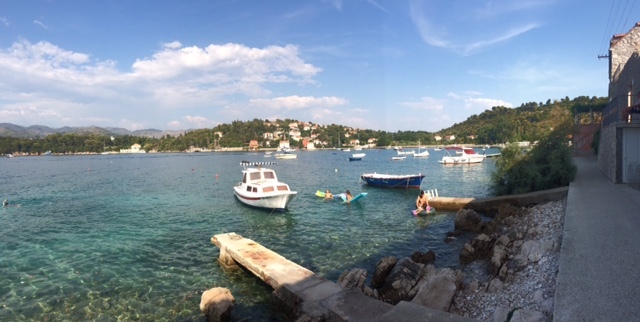 Just 5 minutes away is a sandy beach called Prapatno, the perfect place to cool off and enjoy an ice cream. 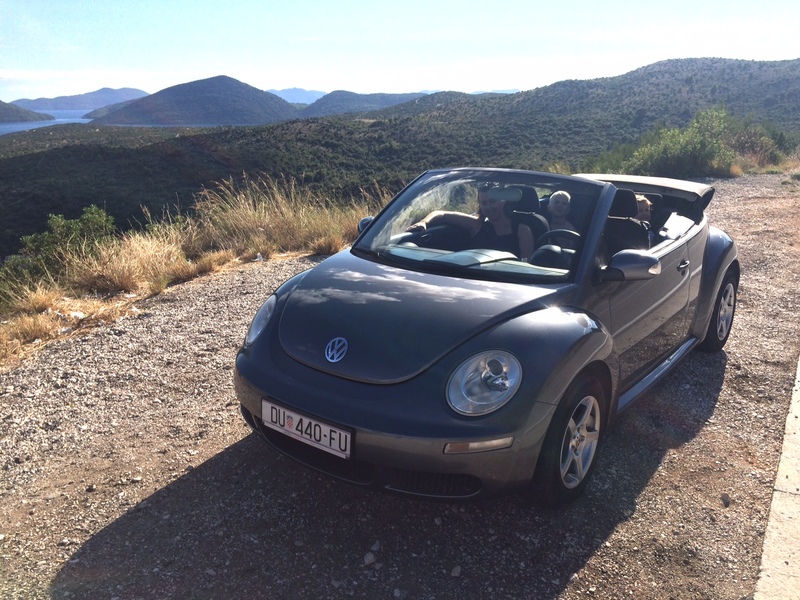 Hire a convertible for the drive up there for extra wow and credibility with the kids! Our Beetle cost just £50 for the day and earned us a serious amount of Cool. 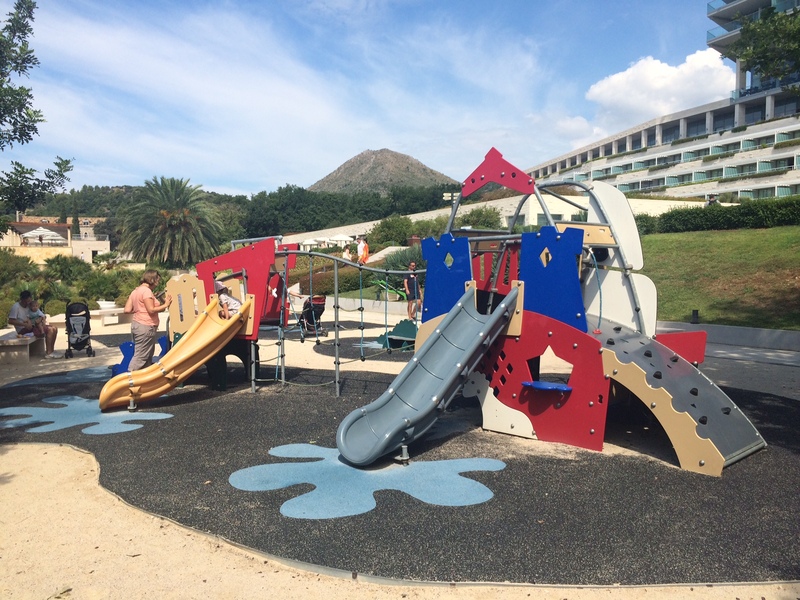 This entry was posted in Accommodation reviews, Europe and tagged Croatia, Dubrovnik, Kids clubs, Scott Dunn, Sun Gardens. Bookmark the permalink. This is awesome! Making note for next year. Cheers!